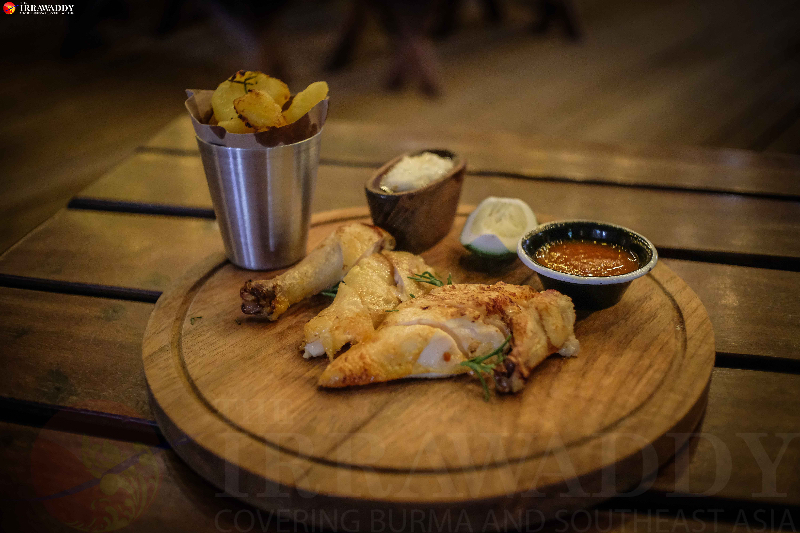 Sharky’s, an award-winning restaurant popular with Yangon residents and visitors, opened a branch in Bagan a little over a year ago and it’s quickly become the best restaurant in Myanmar’s ancient capital. Sharky’s is known for its artisan dishes, original creations and use of local ingredients to offer great, fresh-tasting fare. The new branch stays true to the formula. 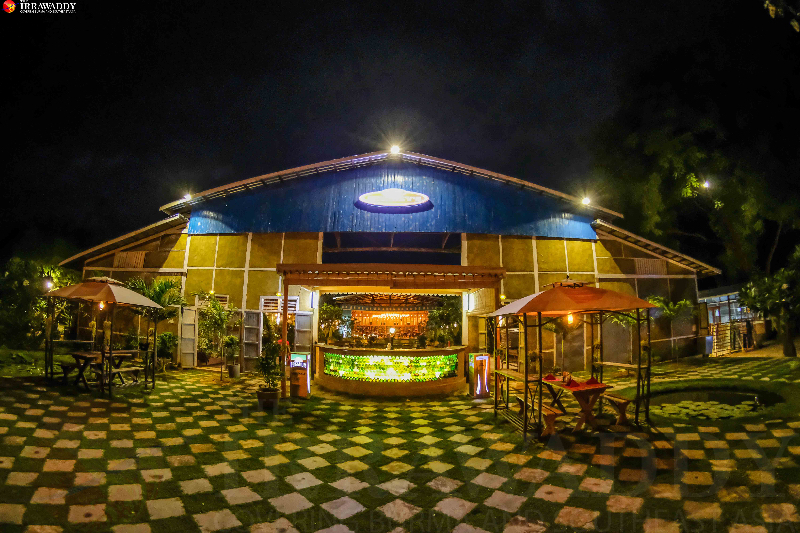 Sharky’s Bagan is located opposite the northern city’s famous Shwezigon Pagoda in a large space that once housed an old cinema called Aung Mingalar. Last week, I went to Bagan for work and after a long day cycling around in the dust with my colleague, we headed there for dinner because I didn’t want to miss the chance to see how the Bagan Sharky’s compared with the original in Yangon. I was especially eager to see how they had restored the theatre. Sharky’s Bagan is truly massive with many tables and places to sit. At the entrance is a small bar decorated with used wine bottles. Beyond that lies a small garden with a lotus pond, which creates a nice vibe as you enter the restaurant. After following a long straight path, we came to the main building and two counters where staff were waiting to greet us. The main building is like a hall with long benches and really warm lighting that provides a friendly atmosphere. 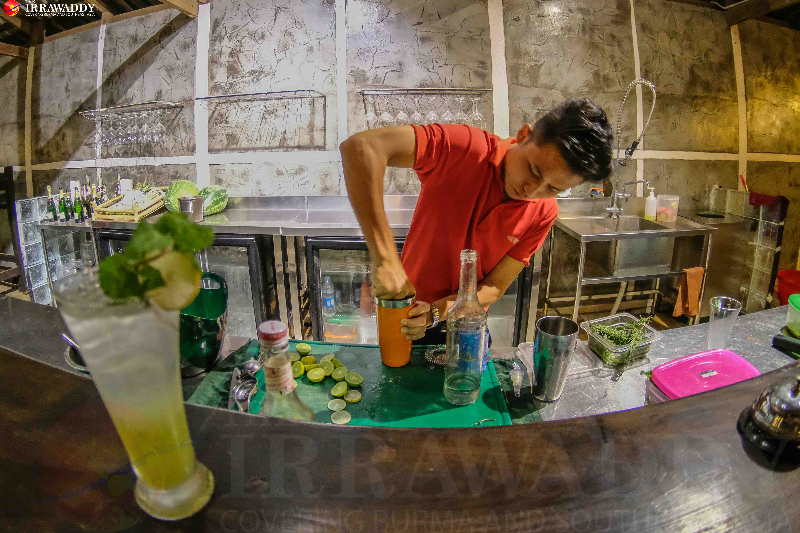 We started with juices — Lemon Mint for me and Rosemary and Honey for my colleague — at 3000 kyats each. My Lemon Mint wasn’t particularly sour and refreshed me nicely after a long, hot day on the bike tour. The staff was friendly and the one who explained the menu was helpful with her recommendations. When we arrived, the restaurant was quiet with only one group of foreigners at the food station. May is actually not the best time to visit Bagan because it’s the middle of summer and generally too hot. But during high season, the restaurant is busy every day with many customers, according to the waitress who served us. I had been hankering for a delicious Shaky’s pizza and ordered a small Italian Basil Pesto Pizza with an organic Rainbow Salad as a side dish. Sharky’s has its own organic farm at the back of the restaurant, which guests are allowed to tour, but we missed the chance to do so because it was late and too dark. To ensure we fully explored the menu, we also ordered the Beef Burger and half a Roasted Chicken. Thanks to the light crowd, our orders came quickly. My Rainbow Salad, which came in a generous portion, really was like a rainbow, with many colorful vegetables. I’m not usually a big fan of salads but I loved this one. Made with fresh organic greens and edible flowers and Sharky’s home-made cheese, it was simply delicious. 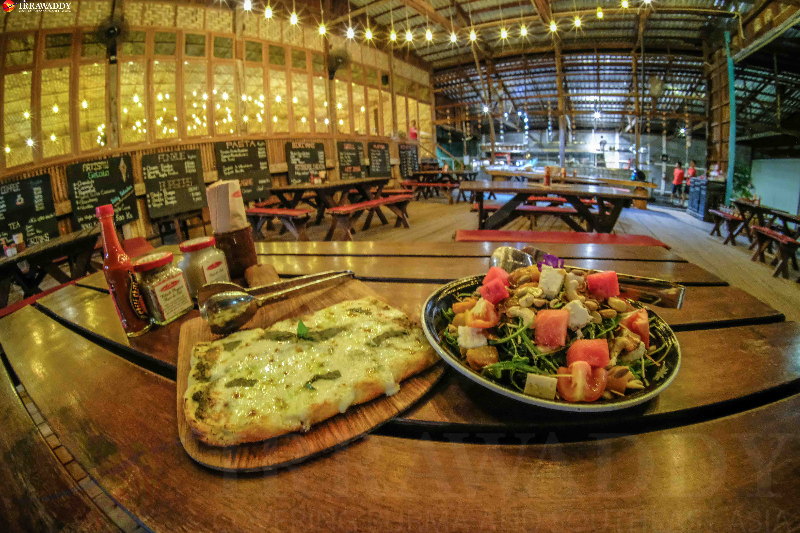 Sharky’s make their own breads, grow their own herbs and salads, and even the eggs they use are organic, while their homemade cheese is justly famous among regular customers. The beef burger was perfectly done and their homemade buns soft. Sharky’s uses local beef for the patty and the large servings meant I was full after eating just half of it. The French fries that came with the burgers were also amazing. The Roasted Chicken was perfectly matched with its sauce and came with potato wedges. Our dinner was too much really and I thought my belly was about to explode. Ordering the small size pizza proved to be the right choice because we were already full but the Lemon Mint juice helped revive me. The menu is a bit different from the one offered at the Yangon Sharky’s and that night we weren’t able to order any pork dishes because they were out of stock. Like the original branch in Yangon , the Sharky’s Bagan has an impressive wine menu and their signature cocktail menu. To be sure, the food is not cheap, and you might feel strange sitting in an open food hall but you will quickly relax. And while you wait you can see how much thought and attention have gone into every decoration and food detail, such as the old wine bottles used as modified bulbs throughout the restaurant. The important thing is you will go back to your hotel with a full stomach and feeling wholly satisfied. No one goes to Bagan for the food but Sharky’s is there for its old customers and for travelers who want a little taste of Western food in Myanmar’s ancient city.